Center-less grinding for large diameter wheels is a process that grinds the surface of a turned part or round bar without the need to support the workpiece on centers. 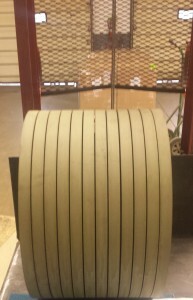 We specialize in Center-less Wheels up to 24’’ diameter and up to 24” wide in Single and Multi-grit bands on Bakelite core. Depths up to and including 2” (50mm) available for through feeding, plunge, and oscillation accommodating both short and long rod manufacture. The centerless grinding wheel is able to perform multi-task either by plunge or through-feed grinding. Easy set-up because no centers are required. Able to perform multiple tasks on a Center-less grinding machine. Center-less grinding is efficiently applied to different application and manufacturing of parts ranging from simple tube bars to relatively complex shafts.